Growing up in Manhattan’s secret community of mages, 17-year-old Jonathan Lockwood has always seen his family as one of the enlightened ones, regularly campaigning to integrate with the so-called “Dulls” and offer their talents to the wider world. But when a looming disaster threatens hundreds of lives, he watches his parents bow to the pressure to stay silent. Horrified, he resolves to intervene himself. Jonathan’s mission leads him to a chance encounter with Amy, a girl who should be Dull but has a clear affinity for magic. As they struggle to tackle the impending threat, he introduces her to the world he knows is rightfully hers. The closer Jonathan and Amy become, the more he finds himself losing his heart—and his certainty about the rules he’s broken. The greater good may come at a price more painful than he ever expected to pay. Set four decades before the Conspiracy of Magic trilogy, Magic Unmasked offers a glimpse into a critical turning point in magical history—events that set the stage for Rocío and Finn’s ordeals. 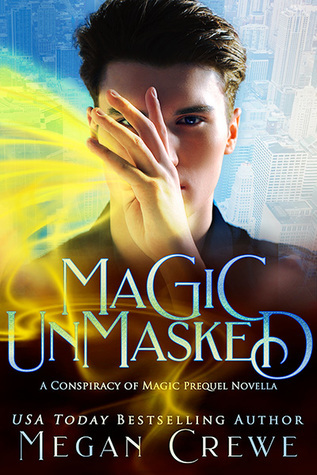 Magic Unmasked by Megan Crewe is a prequel novella to Megan’s Conspiracy of Magic young adult urban fantasy series. This novella takes readers back four decades before the Conspiracy of Magic is set to get a glimpse into the magical world of the series while those that wielded magic stayed hidden to the rest of the world. Jonathan is a young mage still in training who happens upon a girl named Amy who seems to have magical abilities of her own but doesn’t have knowledge of his world. Jonathan’s dilemma is whether to bring her into his world of magic or not as the secret is one that is being heavily debated among the mages. However when Jonathan’s parents come across some very disturbing information about an upcoming volcanic eruption Jonathan doesn’t think they should sit on the news and stay in hiding any longer when their help is desperately needed. When the adults refuse to help Jonathan and Amy take matters into their own hands. One of my favorite things to find in fiction is when a book centers around a real life event that gives me a good connection to the setting in the story. Megan Crewe has taken readers back to 1980 just before Mount St. Helens erupted and written her story around those events bringing the characters even more to life in my mind. On the flip side though what I found missing in here was a certain amount of depth that is probably due to the short length of this story. I would have liked to had more details on the magic, magicians and their world as the book only skims the surface leaving me to rate this one at 3.5 stars but hopefully that will come in the first full length book of the series. At the time I’m writing this review Magic Unmasked is being offered for free for signing up to the author’s newsletter so if anyone is interested in trying out this fast paced series I’d suggest visiting her site for more info. USA Today bestselling author Megan Crewe lives in Toronto, Canada with her husband and son. She’s been making up stories about magic and spirits and other what ifs since before she knew how to write words on paper. These days the stories are just a lot longer. Her YA novels include the paranormal GIVE UP THE GHOST, post-apocalyptic the Fallen World series, the sci fi Earth & Sky trilogy, the contemporary fantasy A MORTAL SONG, and the supernatural thriller BEAST. Yeah I often feel there’s a lot missing in novella’s so that sounds fair enough. Yes, it’s pretty common to wish for a little more in them although some authors really do an amazing job in such a short time.